In photo, left to right, Tammy Bilodeau (UPS) and Stephen Banks (Ability NB Treasurer). 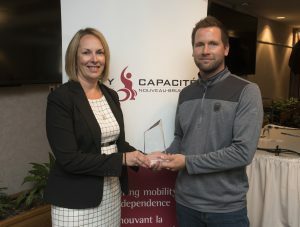 Our Caring Corporate Partner Award is awarded annually to a business that has made outstanding financial and/or in-kind, including volunteer, contributions to Ability New Brunswick over the last year. The recipient of our 2017-2018 award is UPS. In 2017, our Para NB – Sport & Recreation program was pleased to be the recipients of a very generous grant of $63,000 from UPS! This grant has allowed us to purchase iPads for the team to run a new inventory control system for the equipment loan service. We were also able to purchase 18 new pieces of para sport and recreation equipment! While we appreciate the monetary gift beyond measure, it is the volunteers from UPS who are priceless to us. Twice a year, they come to our storage facility to help us prepare the equipment for the change in season. They help change hockey sledge wheels to blades in the fall and switch them back in the spring. A job that would normally take our coordinator days, they accomplish in mere hours! One volunteer graciously donated a work bench to make equipment maintenance easier. They also painted a child’s bedroom, did some landscaping and planted some flowers for one of our service participants. They are always cheerful and eager to help in any way they can. Special mention should go to Greg Beattie and Lee Caswell. They went above and beyond this year!